This section describes perClass classifiers based on assumption of Gaussian distribution. The family of Gaussian classifiers assumes that the observations are generated by a random process that has normal distribution. Density function of a normal distribution is defined by mean vector, and covariance matrix. If multiple Gaussian models are used, they are additionally weighted by priors. In the simplest situation, the assumption is that each class is defined by a single Gaussian density. This yields nearest mean, linear and quadratic classifier. More complex setup assumes that each class may be modeled by a mixture of several Gaussians. This results in Gaussian mixture models. In general, classifiers based on assumption of normality estimate probability densities. Therefore, their use is in practice limited to lower-dimensional situations. If the number of samples is too low compared to dimensionality or data exhibit strong subspace structure, normal models have difficulties in inverting covariance matrices. The nearest mean classifier sdnmean leverages assumption of normality. It uses normal model with identity covariance matrix for all classes. 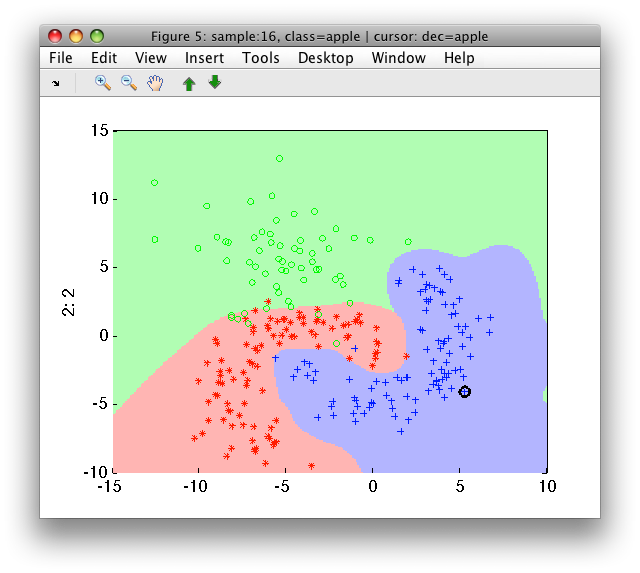 Nearest mean is one of the most simple classifiers useful in situations with few samples and large number of features. 1 Nearest mean            2x3  unit cov.mat. An alternative formulation of nearest mean using distances to prototypes is described here. As for all Gaussian models, user may provide apriori-known class prior probabilities when training sdnmean with 'priors' option. If not provided, priors are estimated from training data set. With the 'scaled' option, sdnmean uses covariance matrices with a separately estimated variance for each feature. In this way, nearest mean classifier takes into account data scaling and will not change if the multiplicative scaling of features is applied. sdlinear is a linear discriminant based on assumption of normal densities. The pooled covariance matrix is computed by averaging per-class covariances taking into account class priors. 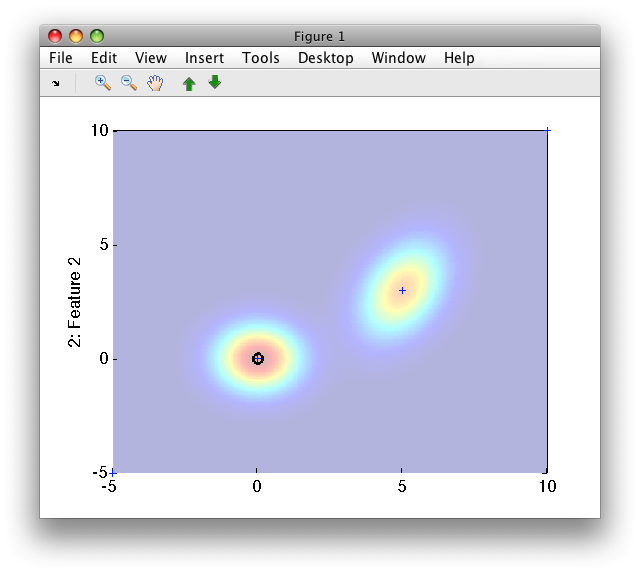 1 Gaussian model          2x2  single cov.mat. Note the normalization step in the pipeline p. This assures that the sdlinear soft output is posterior probability (confidence). Due to this normalization, sdlinear requires two or more classes be present in the input data set. Note that by increasing the apple class prior we lower the apple error. However, the banana error will increase accordingly. The sdlinear classifier may be regularized by adding a small constant to a covariance diagonal. See the following section for an example on how to use automatic regularization. sdquadratic implements quadratic discriminant based on assumption of normal densities. In fact, sdquadrartic is composed of an sdgauss pipeline with an extra normalization step that makes sure the classifier returns posteriors. Due to this class normalization, sdquadratic can only be trained on data set with two or more classes. The quadratic decision boundary is achieved by estimating a specific covariance matrix for each class. 1 Gaussian model          2x2  full cov.mat. Similarly to other normal-based models, the user may fix class priors with 'priors' option, if know apriori. Unlike sdquadratic, sdgauss does not normalize class outputs. It returns probability density and, therefore, may be used to build a detector. Example: I'd like to create a model with two components, one with mean at [0 0] and the other at [5 3] with the first covariance unit and second [1 0.3; -0.8 0.5]. 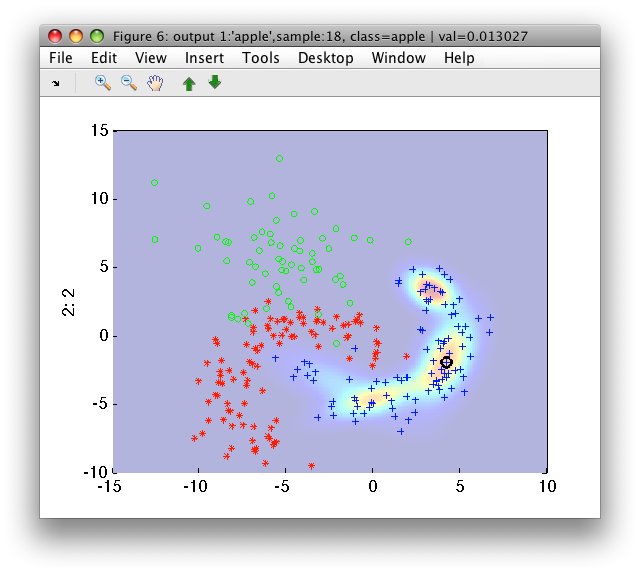 Gaussian model are "generative" which means we can use them to create a data set following the same distribution. Gaussian mixture is a density-estimation approach using a weighted sum of multiple Gaussian components. 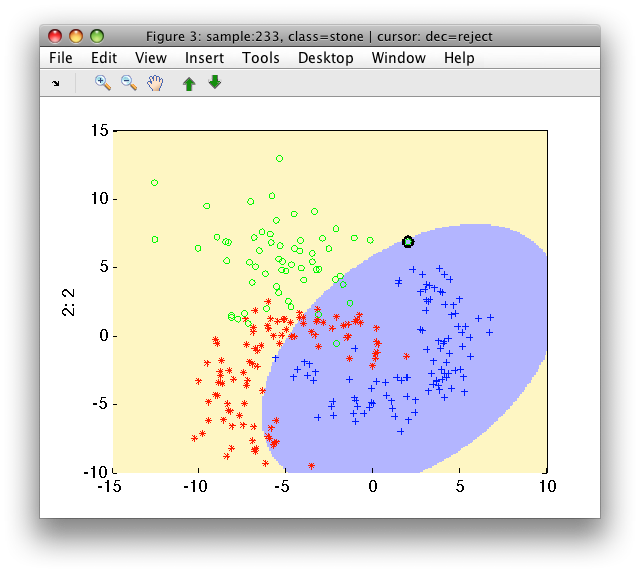 The sdmixture implements a classifier with a separate mixture model, estimated for each of the classes. Advantage of a mixture classifier is its flexibility. Given enough training data, it may reliably model class distributions with arbitrary shapes or disjoint clusters (modes). Multi-modal data often originate in applications where our top-level classes reflect a composition of underlying states. For example, a medical diagnostic tool aims at detection of cancer. As the disease may affect different tissues, we observe our "cancer" class as a multi-modal composition of separate data tissue clusters. Mixture classifier can naturally describe such class distribution. While parameters of a single Gaussian model may be estimated directly from data, mixture models require iterative optimization based on EM algorithm. By default, sdmixture automatically identifies the number of components for each class and then estimates each per-class mixture running 100 iterations of EM algorithm. Number of iterations can be changed with 'iter' option. The estimation of the number of components performs an internal random split of the input data set. Therefore, we will receive potentially different solution each run. Fixing the seed of the Matlab random number generator makes the sdmixture training repeatable. The estimation of number of components is performed on a subset of the input data. By default 500 samples is used per class. This may be adjusted using 'maxsamples' option. 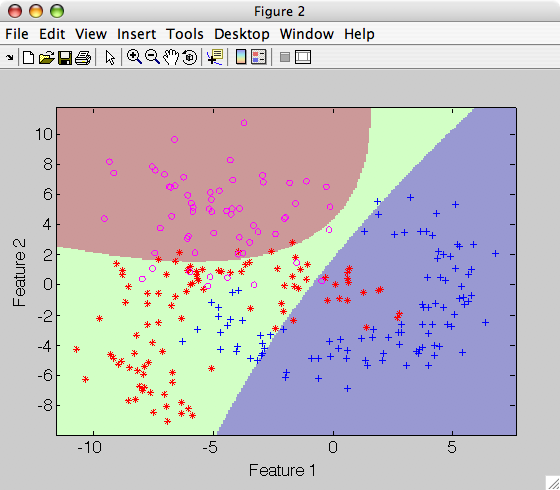 The algorithm uses a grid search considering 1:10 clusters by default. The grid may be adjusted with 'cluster grid' option. 1 Mixture of Gaussians    2x3  15 components, full cov.mat. If a scalar value is given, the same number of components is used for all classes. 1 Mixture of Gaussians    2x3  11 components, full cov.mat. 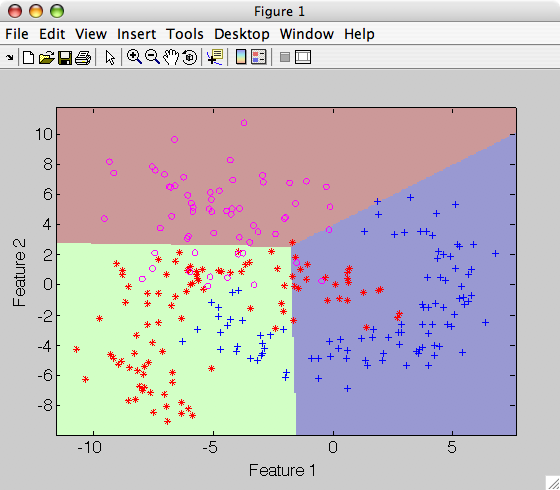 Mixture model which estimates the number of clusters automatically is a powerful data description tool. We may use it to cluster a data set i.e. to identify its distinct modes. 1 Mixture of Gaussians    2x1  8 components, full cov.mat. 1 Mixture of Gaussians    2x8  8 components, full cov.mat. The rand commands make sure both estimated mixtures are identical. The only difference between pipeline pc1 and pc2 is in labeling of the mixture components. Note that we observe only one component at a time in the soft output Figure 4. Others are available via arrow buttons. The decisions of pc2 provide cluster labels. Regularization is a technique of avoiding problem with parameter estimation caused by with small number of data samples in a problem with large dimensionality. Normal-based classifier suffer, in such situations, from low quality estimates of class covariances. This results either in poor classifier performance or failure to train on a given data set. Possible solution is to add a small constant to diagonal elements of the covariance matrices. In perClass, this can be achieved with the 'reg' option. In the following example, we want to recognize handwritten digits represented directly by pixels in 16x16 raster. Quadratic classifier fails to discriminate the digits if trained on our limited training set of 60 samples per class. The full covariances are not reliably estimated. 1 Gaussian model        256x10 full cov.mat. 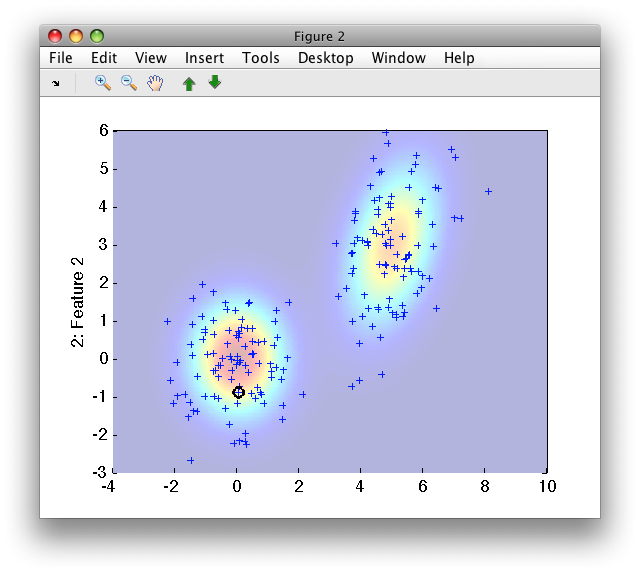 Using the 'reg' option, sdquadratic performs automatic choice of the regularization parameter. The test set error of the resulting classifier is only 8.5%! The 'reg' option splits internally the provided data into two parts and performs a grid search. One part is used for training the model, the other one for evaluating the error. The default splitting fraction is 20% for validation. It may be changed with the 'tsfrac' option.